I’m not good at adventure games. My personal gaming history starts with the Atari 2600, jumps to the Nintendo Entertainment System, and then spreads on from there to other consoles. While many others grew up with Infocom and Sierra On-Line products, I was leaping from one platform to another and gathering rupees to buy the blue ring in my virtual worlds. Even now, I haven’t completely internalized the grammar of the genre. I’m still used to fast-paced action and immediate feedback. 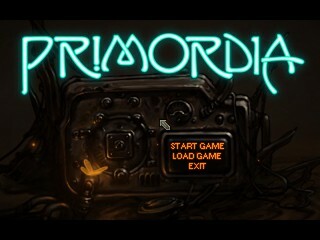 Primordia is neither of those things though. 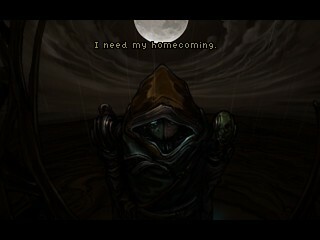 It’s born out of the old school style of graphical adventure games. With puzzles that often required me to write information down, figure out codes, and even input long string of numbers, the game expected me to pay attention to the world, its people, and the story of how events conspired to push Horatio Nullbuilt to leave his encampment. It’s both a reflection of the genre’s past and where many adventure games are right now. It’s also beautiful in its bleakness. That’s what interested me about the game. In a dystopian future where robots rule, man is a myth, and entropy is inching its slow creep to completion, the ability to stay alive is driven by sources of power. 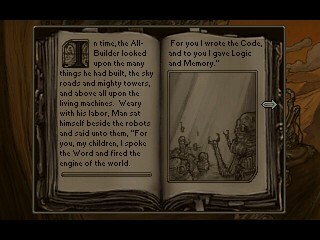 The in-game Gospel of Man describes this as the “spark” that allows machines to move, learn, and ultimately leads to the machinations of the game’s plot. Those that have this power can doll it out to others and thus, in that way, control those around them. Those that have power rule. However, it’s in how you rule that determines your character. By pitting Horatio against ingrained ideologies, military machines, and idle complacency, the game shows what control means in this bleak and dying world. Through investigating the long-buried pieces of the past, the player is given a glimpse into how too much power can be a very bad thing, and how too little power is even worse. The balancing act between the people and their government collides with the bluntness of Darwinian survival. What remains of a complex society of machines borders on a fiercely Hobbesian outlook. 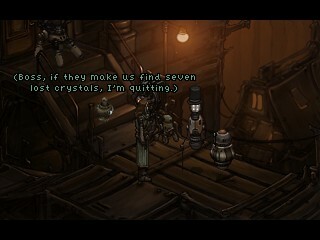 Yet, for all its ideas, Primordia is tied to its genre and the tropes that come along with it. I was often frustrated at my inability to differentiate between a background and an object on the ground. In what should have been quick scenes of visiting a new location, gaining a new interaction, and then moving on, they often descended in to me clicking on everything and trying nearly all combinations until I got the right one. Puzzles that should have been straightforward to those used to seeing them left me annoyed until I discovered the clue right in front of me hidden among the data tucked away in a menu. I often had a very hard time trying to figure out if the problem was the game or just that I wasn’t quite using the right language to get to the solution the game wanted. In what I considered a particularly bad example from my inability to find a way out of it, I got stuck several hours into the game on what I thought was an invalid path. I had chosen valid solutions to several different puzzles in a row and was left in a situation where I couldn’t find the correct combination, hadn’t saved in several hours, and ultimately chose to restart the game. After quickly going through the same choices again, I now knew exactly what to pick and got through the same sections in less than half the time. Yet, opting into that restart has still marred the overall experience for me. It’s always disappointing to find out you aren’t as smart as you thought you were. 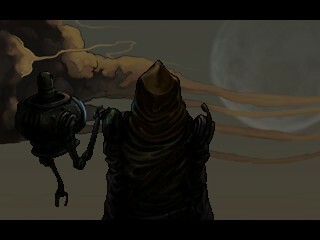 I like Primordia. Even without dystopian robots, I would have enjoyed its message and different characters. I often found myself laughing at the in-jokes like the Water Chip (from Fallout) being a barter option, and even delighted in the confluence of dialogue options arranged in such a way as to have one robot remark that “Alas, poor Lawrence. I knew him, Horatio” in an allusion to Hamlet (Act 5, Scene 1). There is some clever writing going on in this game. Yet, I’m reluctant to recommend it if only because it took me two different tries and many more hours than I expected to complete even one ending. With the knowledge I gained from brute-forcing some solutions, I can cut down my time considerably now, but for those with less time and patience the cost of that same information could be too much. What took me a few days of long sessions playing might take weeks to finally finish. 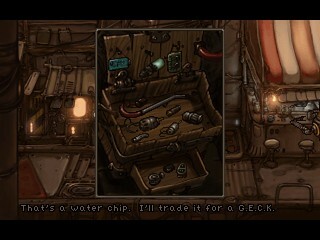 And while none of the puzzles are extremely difficult, many rely on the player knowing how adventure game logic works: that items can be put together and can work in tandem. 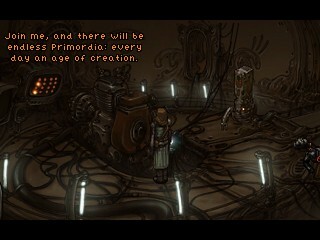 Primordia is a graphical adventure game in the old school style. For all the baggage that means and all the nostalgia such a label invokes, it meets both of them. There is a witty side-kick, a world on the brink of ruin, and the player put into the metal exoskeleton of the most dangerous robot in the entire world: one that can choose his own destiny — and with it that of countless others.